Is it the first day back to school for your child? It is not just the kindergarten children attending the school for the first time, even those who have been to school feel nervous when they have to be back to school. Here are 5 interesting tips for moms to make their little ones feel enthusiastic about their first day of school. Visualize the first day to your child:Children definitely get motivated by narrating how it will be back to school after a long vacation. Tell them how interesting it will be to sit in the new class room, carry new books, meet new friends and above all interact with the new teacher. This will take some time, but, the time you spend with the little one helps him or her to conquer hidden back to school fears. Make a schedule: The worst thing for many children on the first day back to school is getting up early in the morning and getting ready for school. This can be avoided by helping the child to get in the habit of going to sleep early and getting up early a few days before the school starts. Children who sleep well at night can cope with the stress better on the first day of school. Adjusting the schedule daily definitely helps on the big day. Give them the feel of new classroom: If the school permits, take the child to the classroom. This helps him to get acquainted with the environment. Show him the new books and other accessories that would be used in the classroom. If possible allow him to have a small chat with the teacher. You can even request the teacher to help the child in overcoming his fears of being back to school. Introduce to friends: If you are aware of any of the children who would be attending the same class, introduce the child to them. This would help the child get acquainted with the friends. When he meets the same friends on his day of back to school he will mingle with them easily without fear. Do shopping with them: To make them feel less anxious about the first day back to school, do shopping with them. Purchase new books, uniform or new dresses, lunch box and other things he would be using to school. A week before going to school dress him up with the new clothes and praise him how cute he looks in the new outfit. This helps to motivate the child to be back to school with all his new school supplies. Try these five interesting tips your child will avoid the tummy ache that generally develops in kids on the first day of back to school. For more tips, check our Back to School Pinterest Board. 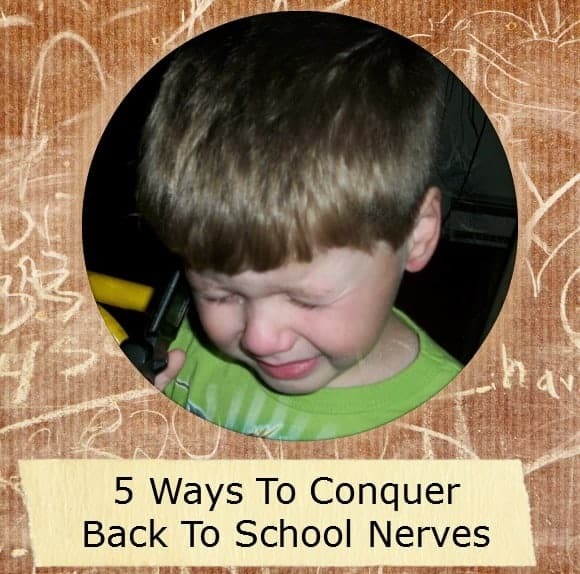 All great tips, so important to prepare our kids for back to school to make them feel comfortable and confident. When I was a kid we never had “meet the teacher” nights. I think that takes so much stress off kids because they can go ahead of time and see the classroom and the school and have some expectations. The not knowing is what was so scary for me. Taking my kids to meet their teachers ahead of time makes them actually excited to come to school. Oh man, I hated the first day of school. I don’t think I ever got rid of those jitters..even in college! Most of my anxiety stemmed around being able to find the rooms on time. I think showing the classroom ahead of time is big if you can swing it! Have to say I’m a big fan if getting them prepared. A drive by or visit to the school is always nice. Getting them to bed early is harder. I always loved the first day of school but totally understand that it is a cause for anxiety for some children. The first tip about visualizing the first day sounds like a very empowering thing for a child. The mind’s eye is so powerful. These are great tips. I like the idea of taking them shopping with you and letting them be involved in buying the supplies. Great tips! I remember my little guy and his nervousness when the first day of school was getting close. It’s such a great idea to talk to them about it. These are very good and useful ideas. I know those nerves are going to come up. Thanks for reminding me to have this discussion with my children. Good advanced morning prep makes such a huge difference in the way our house hums on school days! If we do it right, everyone has time to get where they need to go with as little stress and fuss as possible. Good luck to us all! These are all such great tips. The transition back to school after a break is so tough for some kids–I know, since I’ve been a teacher for so long! These are some helpful ideas to ease them into the new environment. It’s a big change so the nerves totally make sense. My kiddos will be starting a new school system this year. They’re a bit nervous, as am I but I think it’s all going to end up wonderfully positive. Those are great tips. I love the idea of making a schedule. I think that could make things go a lot more smoothly. These are all really great suggestions. Returning to school can be so hard for some kids.